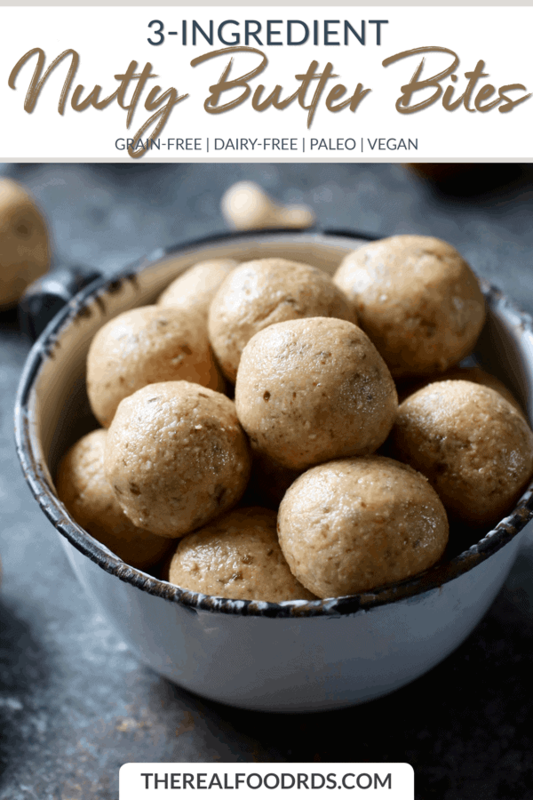 Three wholesome ingredients is all you need to make these healthy, no-bake Nutty Butter Bites – a vegan-friendly and grain-free recipe. 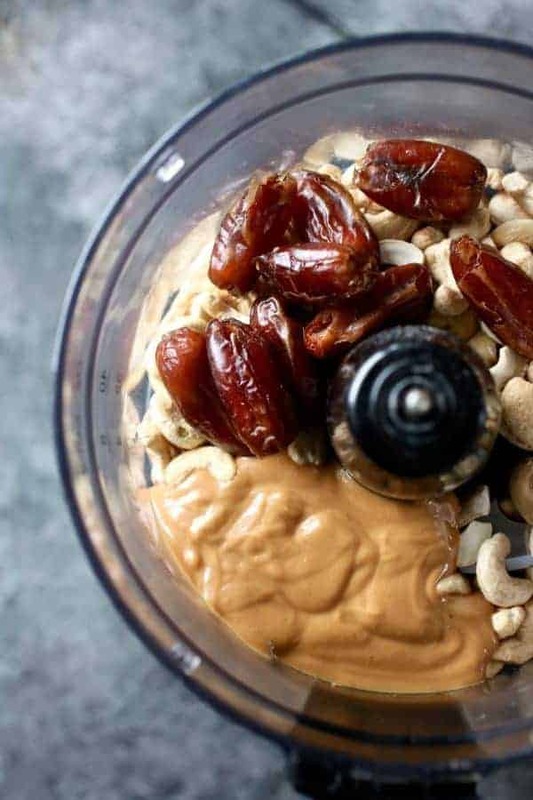 A healthy snack recipe made easy with three simple ingredients – raw nuts, natural nut butter and dates. That’s it! Simplicity is nice. 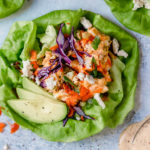 When I can throw a couple of real food ingredients together and make something delicious AND nutritious, it’s a big win in my book. My honest opinion is that too often we complicate things. 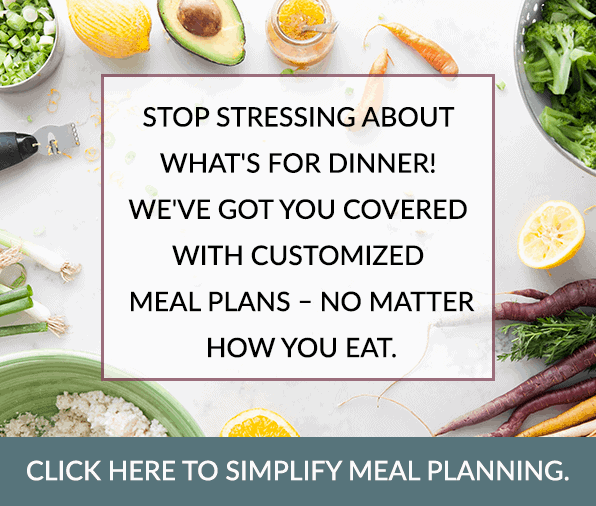 Not just with recipes but in other areas of our life. We tend to complicate exercise, we complicate our diet, how we parent, how we live each day, etc. etc. There’s an overabundance of information floating around on the internet that conflicts, is unclear, confusing and sometimes may even make us feel like we’re doing it all wrong. 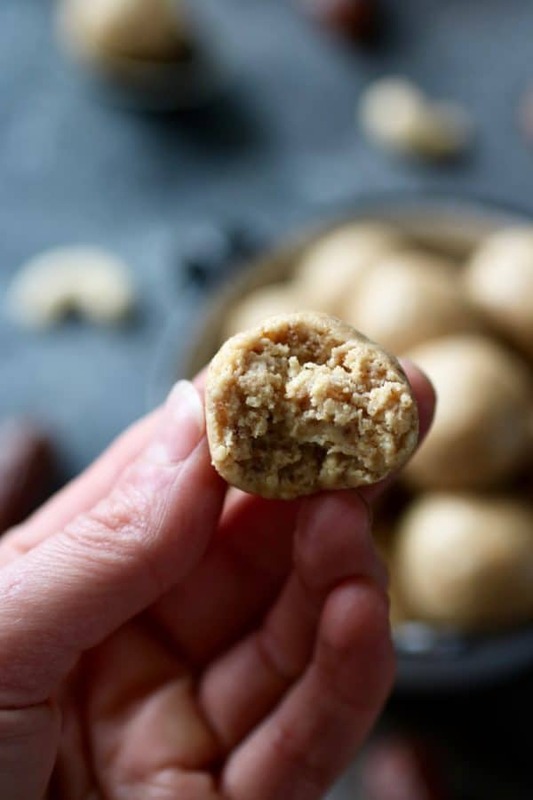 3-Ingredient Nutty Butter Bites are refined sugar-free. Woot! 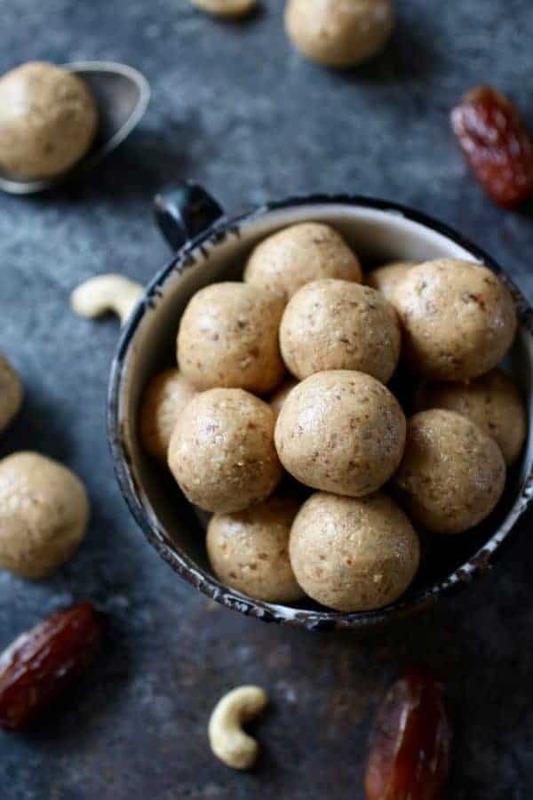 The dates add a naturally sweet flavor and they also provide some good nutrition. They’re a healthy substitute for refined sugar in recipes due to their sweet taste, nutrients, fiber, minerals and antioxidants. I recommend tossing in 10-12 delget noor dates depending on how sweet you prefer the bites to be. Personally, I like them more on the nutty side and less sweet so 10 dates usually does the trick. Using fewer dates will also help to reduce the total grams of sugar, as dates are naturally very high in sugar. So although they’re a “real food” and come with nutritional benefits, they are a high-sugar food. Please note that if you use medjool dates, they are a bit bigger so you may want to add less. The options are endless with these Nutty Butter Bites. 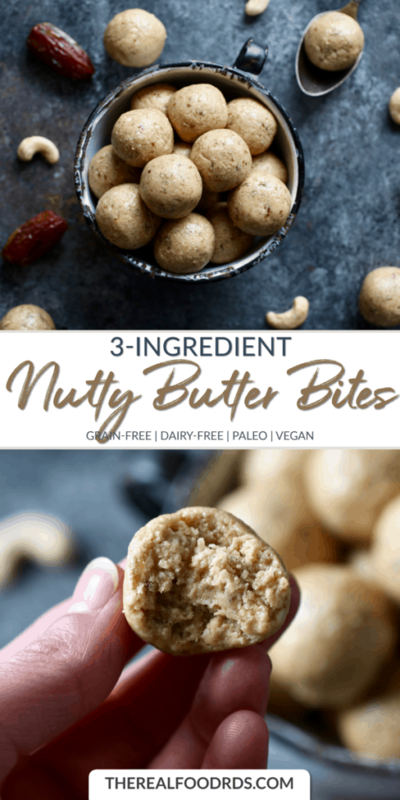 It’s easy to change up the flavor of these Nutty Butter Bites by adding additional ingredients or by changing up what kind of raw nuts and/or nut butter you use. I tend to go with what I have on hand because there’s no need to make a special trip to the grocery store. 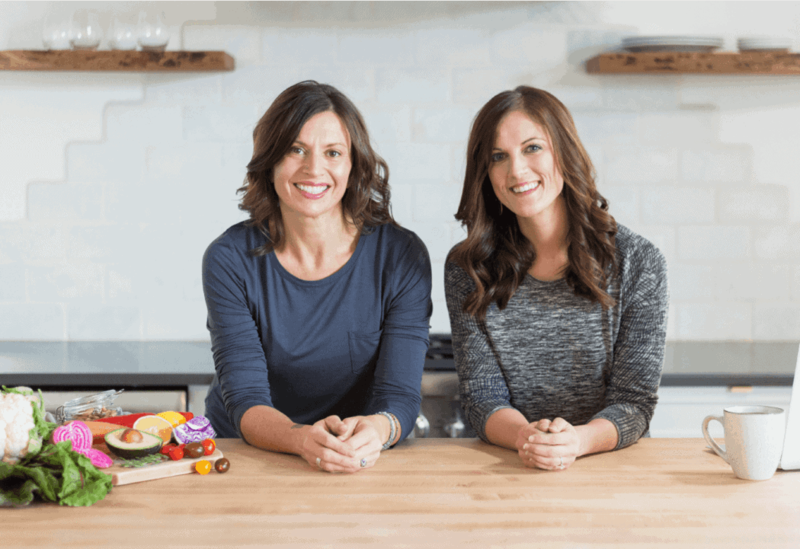 Some ideas of ingredients you could add include no-sugar-added dried fruit like raisins or cranberries, spices like cinnamon and nutmeg, mini chocolate chips, cocoa nibs, coconut flakes, chia seeds…the list goes on and on. 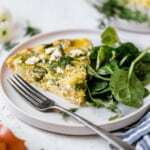 If you choose to add additional ingredients, you’ll want to pulse those in just before forming the round bites. A food processor works best. You will need to scrape the sides of the food processor a couple of times as the dough will stick. The dough will feel a little oily when it’s ready. 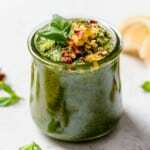 Depending on the consistency of the nut butter you use, as they do vary, you may need to add additional nut butter to get them to stick together nicely. I prefer using a smooth/runnier nut butter. Press dough firmly when rolling into bites. 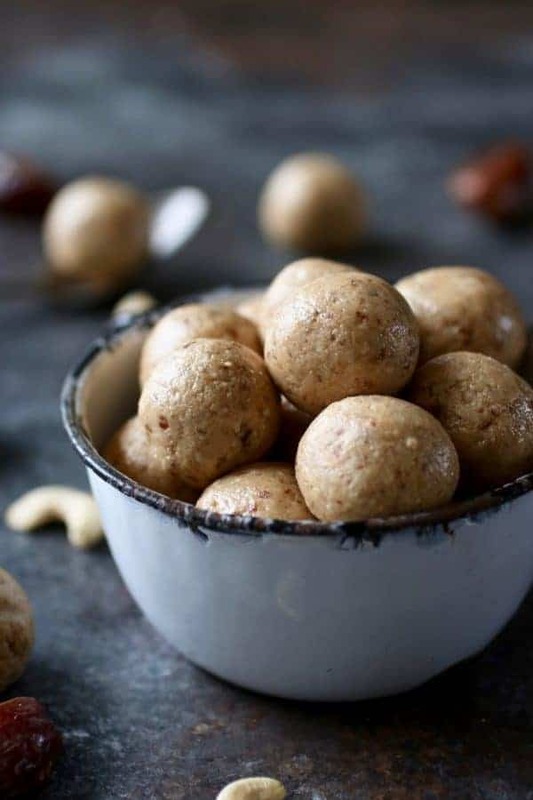 Nutty Butter Bites make for a wholesome and tasty snack or I like to enjoy one at night for a delightful little treat. 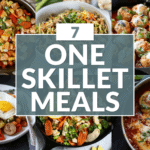 Are you ready to scrounge your pantry for the ingredients and give this recipe a try!? 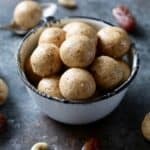 Three wholesome ingredients is all you need to make these healthy, no-bake Nutty Butter Bites. 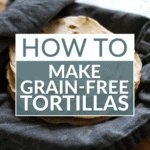 A vegan-friendly and grain-free recipe. 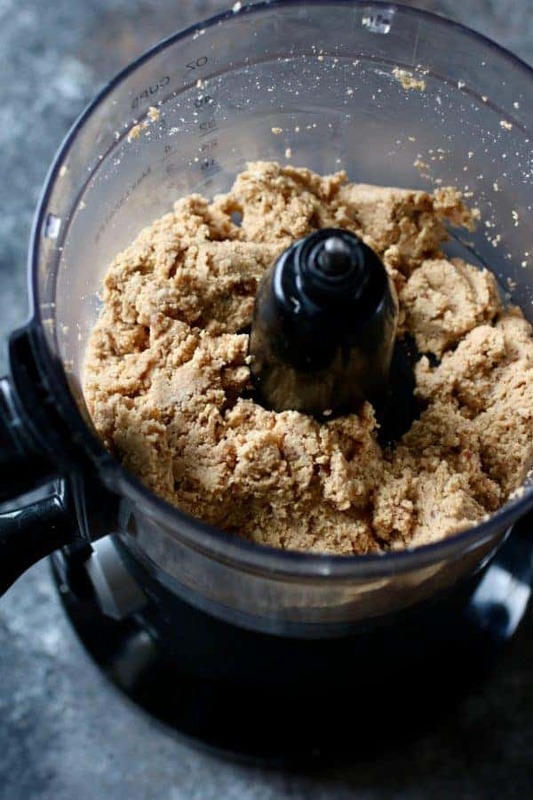 Place raw nuts, nut butter, and pitted dates into a food processor (may use high-powered blender). Process for 3-5 minutes or until ingredients start coming together. Scrape the sides as needed. Test dough with hands to see if dough will stick together to form a ball. Depending on consistency of nut butter, you may need to add an additional 1-2 Tbsp. A smoother/runnier nut butter works best. With hands, firmly and with pressure, form the dough into about 20 small round bites. 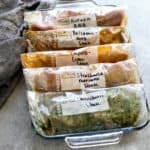 Store in a sealed container in the refrigerator for up to 2 weeks or freeze for up to 3 month. Woah, these sound amazing! I love the idea of these. Definitely going to try them! Awesome! Let us know how you like them or if you add any additional ingredients! Thanks, Dana! 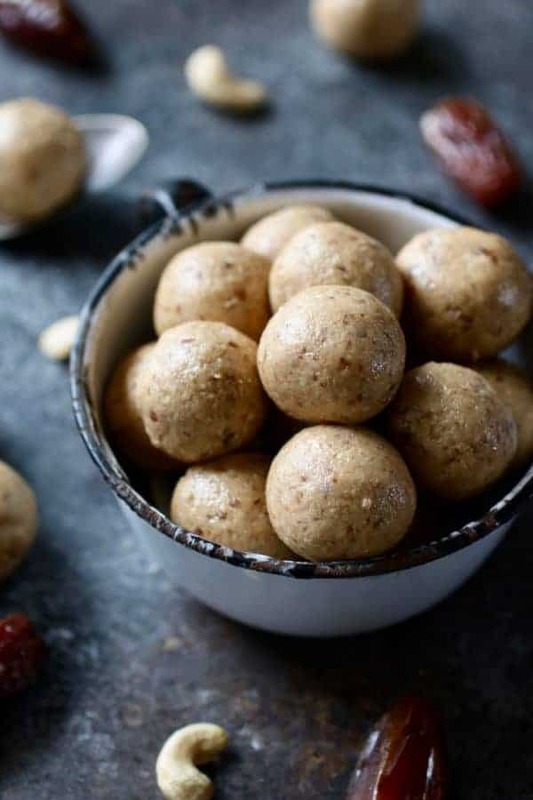 Hi – any suggestions on how to make these nutty butter bites fruit-flavored (with real fruit, of course)? Maybe blueberry or strawberry? You could add a no-sugar added fruit spread. Similar to our 4-Ingredient PB & J Bites. These are delicious! Just made them and I don’t think they will last long. 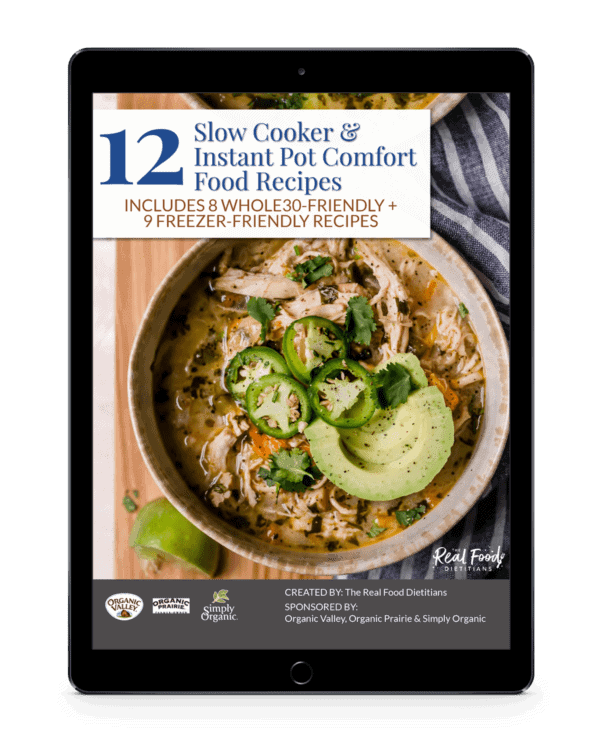 Hard to believe there are only 3 ingredients – great recipe! Thank you! Glad you enjoyed them! !